Embark on an adventure with the real King David. In 4 action-packed lessons with speaker and author Vince Miller discover how you can become God's Man. 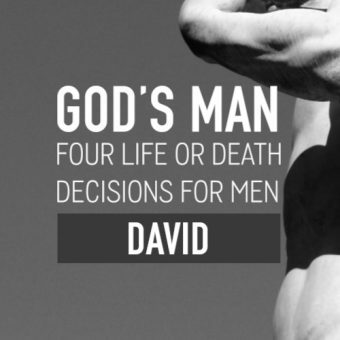 Come expectant, leave empowered and ready to face life decisions like a man. A MAN'S INNER STRENGTH. God’s man welcomes the inward adventure. This message addresses the need for transparency, emotional awareness, and laying down the masculine ego. A MAN WARS WITH SIN. God’s man declares war on fear and shame. This message addresses the need to prepare, charge, fighter and finish the battle of sin. A MAN LEADS WHEN IT COUNTS. God’s man leads in adversity. This message addresses the need to lead when faced with adversity by seeking, submitting, and suppressing to succeed with God. A MAN NEEDS BROTHERS. God’s man never does life alone. This message addresses the need for accountability and brotherhood for those who are fatherless and brotherless. I was so overwhelmed with joy by the power of Vince's messages and the stories. It was great to put into action the idea of meeting with an accountability partner that weekend, and not hold off. God used the messages by Vince, the small group discussion, and even the meals and free time to work on my heart and challenge and encourage me. I can't express with words the impact that this past weekend has already made on me mentally, emotionally, spiritually, my life (now and later). It's more than a feeling. I've never been so emotionally exhausted and yet so spiritually renewed. It was great having the small groups discussion after the main sessions, to process what we learned. This really helped it to stick. 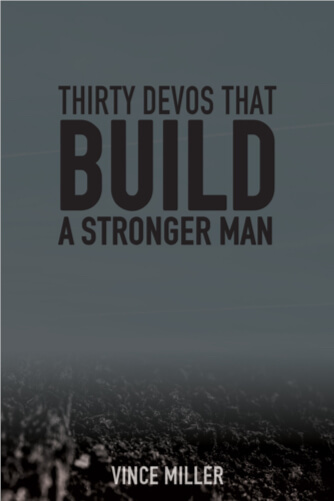 If you want to empower your men as they head home and face the decisions and challenges of life then you’ll love presenting them with this devotional book - Thirty Devos That Build A Stronger Man. Use the B.U.I.L.D. methodology with these short 5-minute daily readings, scripture, and then journal thoughts alongside each devotional. Help men build a new habit in just 30-days. MOTIVATING MEN ON TOPICS OF MANHOOD, FATHERING, MENTORING, DISCIPLESHIP, & LEADERSHIP. "The problem is not 'all the bad things men are doing,' but rather the kind of men we are building. What we need to do is build better men." Abandoned by his drug-addicted father at the age of two, Vince Miller grew up in a challenging and anxiety-producing environment. He endured the strain of his mother’s two failed marriages as well as her poor choices and drug use. Fortunately, during Vince’s formative teen years his grandfather, a man of faith, stepped up to mentor Vince, guiding him through a particularly difficult period. Though he resisted initially, Vince surrendered his life to Christ at the age of 20. Soon after, he would be with his grandfather on his deathbed as his life was taken by cancer. At that time, Vince made a commitment before God to give back by mentoring men as he had been mentored by his godly grandfather. Vince’s story demonstrates the importance of mentors to support others in overcoming the enormous hurdles that manhood, mentoring, fathering, and leadership present to a man who wants to live right before God. Audiences respond to Vince’s stories and teaching that motivate, convict, and sometimes even shock. He inspires men to lead, mentor, and disciple others with his intelligent case for faith, inspiring presentation of the gospel, and stories of choices he made as a man, husband, and father. GREAT FOR: Men’s Conferences, Men’s Events, Weekend Services, Keynotes, and Retreats. AUTHOR OF: Convictions for Men, Thirty Virtues That Build Men, The Generous Life, and 10+ Men’s Small Group Study Guides and Small Group Videos. TOPICS: Manhood, Fathering, Mentoring, Discipleship, and building better men.